With the burner still on high, use beef broth (about 1 cup) to deglaze the pot, scraping the bottom with a whisk. 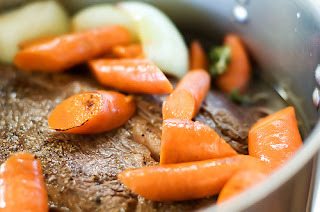 Place the roast back into the pot and add enough beef stock to cover the meat halfway. Put the lid on, then roast for 3 hours for a 3-pound roast. For a 4 to 5-pound roast, plan on 4 hours. The roast is ready when it's fall-apart tender. With his wife and two daughters at his side, President Barack Obama will raise his right hand and place his left on two stacked Bibles as he takes the oath of office for another four-year term. His second inauguration promises the pageantry of the first, but on a smaller scale than 2009, when a record 1.8 million people filled the nation's capital to witness Obama making history as America's first black president. Obama has chosen to use two Bibles during his swearing-in — one owned by Martin Luther King Jr. and the other by Abraham Lincoln. He used the Lincoln Bible while taking the oath four years ago. He is adding King's Bible for an inaugural ceremony that will take place on Jan. 21, the federal holiday honoring the civil rights leader. At the 57th presidential inauguration a week from Monday, Chief Justice John Roberts will administer the oath of office to Obama and Supreme Court Justice Sonia Sotomayor will administer the oath to Vice President Joe Biden. It's a day rich in history and tradition. Q: Why is the inauguration on Jan. 21 instead of Jan. 20? A: The Constitution's 20th Amendment, passed by Congress in March 1932 and ratified by the necessary states the following January, sets the inauguration date as Jan. 20 at noon. Because that's a Sunday this year, Obama will take the official oath of office that day in a private ceremony. A public ceremony will be held Jan. 21 on the west front of the U.S. Capitol. Local officials are planning for an estimated 600,000 to 800,000 people to crowd onto the National Mall to witness the oath-taking ceremony. This is the seventh time the inauguration date has fallen on a Sunday. Inaugural ceremonies, however, are not traditionally held on Sundays because courts and other public institutions are closed. Before 1933, the president had been sworn in on March 4, typically the final day of the congressional season. But the stretch between the November elections and the March 4 inauguration led to a lengthy lame-duck sessions of Congress and became a concern during times of national crisis. Sen. George Norris, R-Neb., suggested the 20th Amendment, which called for a new Congress to begin on Jan. 3 and for the president to be inaugurated on Jan. 20. President Franklin Roosevelt's first inauguration, in 1933, was the last swearing-in ceremony held on March 4. Q: What is the oath the president recites? A: "I do solemnly swear (or affirm) that I will faithfully execute the office of president of the United States, and will to the best of my ability, preserve, protect and defend the Constitution of the United States." Those words transform citizen to president and mark the beginning of a new administration. Franklin Pierce, in March 1853, became the only president to "affirm" instead of "swear" that he would protect and defend the Constitution. There are Internet mentions suggesting that Herbert Hoover also opted to affirm, but the Herbert Hoover Presidential Library Association in Iowa says Hoover did not repeat the oath in 1929, and simply said "I do" after it was read to him. Q: Does the chief justice of the United States always administer the oath? A: Traditionally, it is the chief justice who presides over the swearing-in ceremony. But there have been about a half-dozen exceptions including in 1923 and 1963. In 1923, Vice President Calvin Coolidge took the oath of office at his father's residence in Plymouth, Vt., following the death of President Warren Harding. Coolidge's father, Col. John Coolidge, was a notary public and he administered the oath to his son. In 1963, Sarah Hughes, a U.S. district judge in Texas, administered the oath to Vice President Lyndon Johnson aboard Air Force One at Love Field in Dallas, after the assassination of President John F. Kennedy. Hughes became the first woman to swear in a president. Q: When was the parade first started? A: The first organized parade occurred at the inauguration of James Madison in 1809. But the tradition dates back the country's first inauguration of a president, George Washington, in 1789. Local militias joined Washington's procession as it passed through towns on his journey from Mount Vernon to New York City, where he was met by the Continental Army, government officials and other prominent citizens who escorted him to his swearing-in ceremony at Federal Hall. During Abraham Lincoln's second inauguration in 1865, African-Americans marched in the parade for the first time. Woodrow Wilson's second inauguration in 1917 saw women, for the first time, take part in the inaugural parade. Obama's parade four years ago included the Lesbian and Gay Band Association for the march along Pennsylvania Avenue to the White House. The association was the first lesbian and gay group in history to participate in a president's inaugural parade. Q: How many inaugural balls are there? The first inaugural ball was held in 1789 to honor Washington, and came one week after he was sworn in during a ceremony in New York City. The tradition of the inaugural ball really began in 1809 when Dolley Madison hosted a gala for her husband, James Madison. Four hundred tickets were sold for $4 each. The tradition took hold as supporters reveled in the idea of a night to fete their new president with dancing and music. Some presidents shunned the idea and wanted to avoid an elaborate celebration. Presidents Franklin Pierce, Woodrow Wilson and Warren Harding requested no balls at all. In more recent times, President Bill Clinton went from 11 inaugural balls in 1993 to a record 14 in 1997. Obama had 10 official inaugural balls in 2009, but has decided to cut the number to two this year amid a struggling economy. One ball will be the invitation-only Commander In Chief's Ball, started by President George W. Bush for members of the armed forces. Tickets will be free for invited guests, including active duty, reserve and Medal of Honor recipients, among others. The other ball, called The Inaugural Ball, is open to the public, though only a limited number of $60 tickets were made available. Q: Who pays for all this? A: Much of the tab is picked up by supporters and other private donors, as it has been for years. In 2009, Obama raised $53 million in private money for hisinauguration. The private money pays for the official inaugural balls, the traditional parade, giant TV screens on the mall for the swearing-in and thousands of portable toilets. Public money is used for security, which is harder to put a price tag on. Secret Service doesn't discuss it, but the federal government reimbursed the District of Columbia $44 million for the 2009 inauguration. That was just for city costs, not Secret Service or military personnel. -The Architect of the Capitol has $4.2 million to spruce up the Capitol grounds for the swearing-in ceremony on the west front. That money also pays for the inauguralplatform under construction, along with bleachers and barricades. -Nearly $2 million has been approved for U.S. Capitol Police. -$1.2 million has been budgeted for the Joint Congressional Committee on Inaugural Ceremonies, which handles all of the events taking place at the Capitol grounds for the inaugural. Q: Who plans and coordinates the inaugural festivities? A: The Presidential Inaugural Committee, chosen by the president-elect, coordinates all of the official events outside the Capitol, where the swearing-in takes place. The committee handles the parade, official inaugural balls and planning for the crowds on the National Mall. The Joint Congressional Committee on Inaugural Ceremonies is responsible for staging the day's activities on the Capitol grounds, meaning the swearing-in ceremony and the traditional inaugural luncheon that follows for the president and vice president. For the Department of Defense, the Joint Task Force National Capital Region coordinates the military's participation in inaugural activities. That includes marching bands, color guards, firing details and salute batteries for the parade as well as security and medical support for inaugural activities. About 5,000 service members are expected to take part in this inaugural. Sometimes you may feel you’re in a compromised position. Perhaps it’s a neighborhood disagreement or an upset in the workplace. Or it could be a family squabble. Although not directly involved, you may be tempted to take sides, adding your own opinions to an escalating confrontation. But isn’t there a better approach – one that doesn’t draw you into the fray? Support given without words, either pro or con, can be very effective. Maintaining a balance when matters are spinning out of control can help contribute to an amicable solution. I’ve found that this approach requires keeping my thought free to welcome in healing ideas that include a genuine love for both parties. Focusing on each one’s spiritually pure nature – and the God-like attributes making up that nature – helps elevate my thought above the controversy. We can face down the dark thoughts that try to crowd out joy, and hold fast to the goodness inherent in each individual as a loved expression of a divine Parent. In doing this, we can avoid taking on personal responsibility for the outcome. Our efforts to rise to a healing atmosphere of thought are rewarded. In this love-filled space, where God reigns, there can be no support for feelings of antagonism or alienation. This approach brings with it a peaceful assurance that God is operating in the minutiae of our life – and removes the onus of taking sides. I saw this proved recently. A disagreement between two members of opposite sides of the family was threatening the plans for a family gathering. As an onlooker to this squabble, I could take sides, or I could let prayer raise my thinking to a higher realm, a healing one. I reasoned that taking sides would only widen the rift, but refusing to side with either party and supporting a right solution through prayer would help restore harmony. This statement from the writings of Mary Baker Eddy inspired me to proceed in this direction: “Love enriches the nature, enlarging, purifying, and elevating it”. I knew my thinking about the situation needed elevating. This was evident when one of the individuals attempted to win me over to her side. The idea of Love “enlarging, purifying, and [especially] elevating” my nature enabled me to lift my thought above the temptation to take sides, and still to remain loving, but neutral. As I maintained this altitude, challenging the downward pull to dwell on the discord, I saw that I could remain impartial by refusing to indulge in criticism of either party. I found support for this stance in this statement, also from Science and Health: “Nothing is real and eternal, – nothing is Spirit, – but God and His idea. Evil has no reality. It is neither person, place, nor thing, but is simply a belief, an illusion of material sense”. When we witness disturbances that threaten to throw us off balance, we can be most effective by maintaining our spiritual poise. The door to that “elevator” is always available as we seek a healing refuge in which to open our thought in prayer to God’s messages. In the quiet of elevated thought, we can rejoice in the promise of healing that lifts us into the atmosphere of Love’s ever-presence where there is no room for misunderstanding or hurt feelings. The victory for me lay in not taking sides but in maintaining a spiritual altitude. Later I heard from one family member that peace between them had been restored. Staying out of the fray, but not ignoring it, enabled me to contribute through prayer to its resolution. Siding with God, instead of persons, places us in a healing role. What better part to play!